As many of you are aware we are implementing some changes which will be in place with immediate effect (Lessons already in the diary will still go ahead) ~ we have been forced to make these changes due to clients being unsatisfied with the online booking system,unfortunately this does not create more hours in a day but we hope some of you may enjoy the group sessions which will enable you all to ride more frequently. 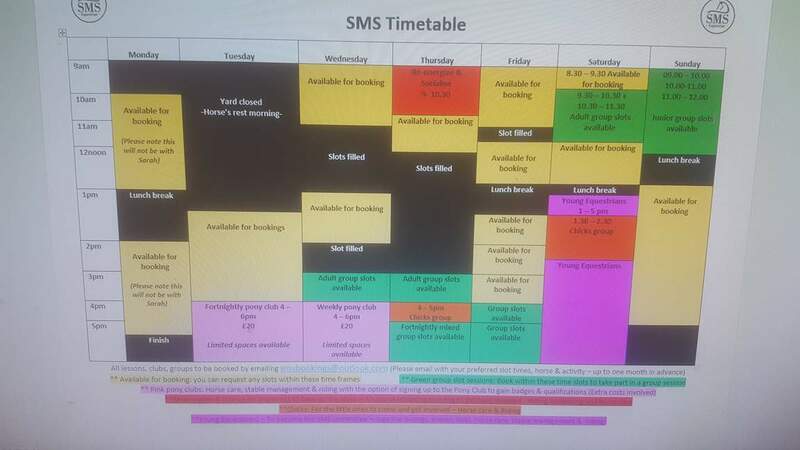 The timetable pictured will be the weekly timetable for all term-time weeks but may alter during school holidays. We would also like to inform you that from 1st September 2017 SMS Equestrian will be increasing the prices of some our lessons. The current pricing structure has been in place for the last four years and this price increase is something which is now unavoidable. Due to the influence of many factors, we had to take this decision to survive in the industry. The increase in prices of various provisions and along with the overhead charges has compelled us to raise the prices. In an effort, not to compromise on the quality and service we provide for you and the horses, we are taking this initiative. We tried to avoid this increase in price, but it seems inescapable to us. To retain our customers who truly believe in what we do here at SMS, providing you with quality and intimacy, we have taken this step and hope that you understand our situation. We believe that you would not want the quality we offer to drop for any reason. We wish to continue to serve you with the standards we have set and continue to innovate new ideas in the future. We hope to maintain many more years of business relations with you. We thank you for your understanding. Of course, we will honour any pre-booked lessons that were made before this announcement. Lesson payments can be made via bacs at the time of booking or at the beginning of the allotted lesson time – please note that no lesson will commence without a payment being made first. If the situation arises where a lesson needs to be cancelled, we encourage this to be done at least 48hours before the lesson to avoid payment for the lesson being required.